Create more space in your showroom or store with this Wire Grid Gondola! This Gondola can easily display any kind of merchandise! Included in your purchase are casters, which make for a mobile gondola unit that can change locations as your displays change! Coming in a beautiful white finish, this Grid Unit will look great anywhere you put it and will draw attention to your products. Add accessories to this unit to make it look even better and attract more customers. Accessories include shelves, brackets, Faceouts, peg hooks, Hangrails and many other grid accessories that can be purchased separately here at Store Supply Warehouse. The bases are also sold separately for use with your existing wire grid panels. Measuring 48"L x 66"H x 24”, this Gondola Unit provides you with plenty of room to create a magnificent display! 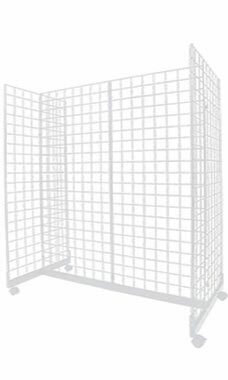 Unit includes (4)2' x 5' Wire Grid Panels; (9)Wire Grid Connectors and (1)Gondola Base with Casters. In stock and available for shipment immediately. This has made my life so much easier and looks super professional! This gondola unit is exactly the perfect size to use in my booth at arts and crafts shows. It is so easy to transport and the wheels on the base makes it very convenient to roll into place! The construction is extremely well designed and made! I rate this gondola unit as GREAT! This unit works great for a mobile display, it holds a lot of items an when used with waterfall faceout tubes makes a really nice looking unit I have one made with 4 foot grid that I got in separate pieces, but the 5 foot is cheaper when purchased as a unit. I was so glad to see this product and do not remember it being available two years ago. I needed something for the middle of my art fair tent. This makes for nice displays without taking up a lot of room.